Whether you call it eggplant parmigiana or an eggplant Parmesan recipe, this fabulous Italian recipe will be a hit with family and friends. Eggplant parm was my mother’s trademark dish. Her entire family was always delighted every time they saw it when she had them for dinner, or brought it to a pot luck get together. Cut eggplant into 1/4 inch slices. Sprinkle the eggplant with salt and let stand in a colander for 30 minutes. Rinse and pat the slices dry with paper towels. Brush the eggplant slices with 2 tablespoons of the oil. Place in a single layer on a baking sheet and bake uncovered at 450°F until very soft, about 30 minutes. While the eggplant is baking, heat 1 tablespoon of the oil and sauté the onion and garlic over medium heat for about 10 minutes. Add the tomato sauce, basil and oregano and simmer 20 minutes. Season with salt and pepper. Layer 1/2 the eggplant in a lightly oiled 1 1/2 quart shallow casserole, top with half the sauce, then half the mozzarella and half the parmesan cheese. Repeat. Bake uncovered at 350°F for about 25 minutes, until hot and bubbly. Want to up the veggie content? Add 1/4 pound sliced mushrooms and 1 chopped zucchini to the pan and sauté with the onion and garlic. You can also bread the eggplant by dipping the slices into a beaten egg, then into seasoned bread crumbs. The slices can then be fried or baked (fried is amazing). The fact that her eggplant parm is so treasured by her family is quite an accomplishment for my mother when you consider she isn’t Italian. She did, however, learn to cook from her Italian mother-in-law, who was by far the best Italian cook I have met to date. Eggplant recipes are not always my favorite. It is a vegetable with a distinctive taste and a texture that is not always appealing to me. But make eggplant parmesan with it and it changes everything. There is just something about the marrying of flavors in this recipe that makes it delectable. This is not quite my mother’s eggplant parmesan recipe. Although I still cannot make it as well as she did, this version is still fantastic. The traditional recipe calls for the eggplant to be breaded and fried. Times have changed and we now look for recipes that are healthier. 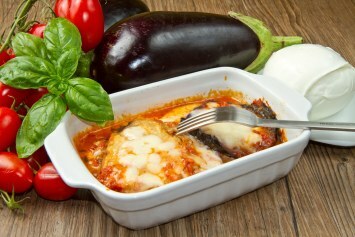 This way of preparing eggplant Parmesan does cut the fat. If you are looking to cut the fat further, use skim milk mozzarella cheese or leave it out entirely. My mother used only Parmesan cheese and as I said, it is fabulous. This eggplant Parmesan is a wonderful diabetic recipe. It is also gluten free and quite low carb (although the first stages of Atkins low carb diet does not allow tomatoes). It’s also a great vegetarian main course. I hope you enjoy this eggplant recipe. It is a delicious way to use this little used vegetable and may get your family to eat something different. 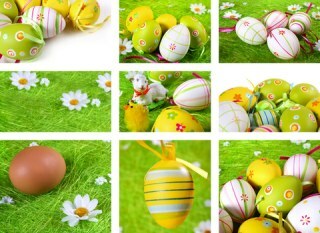 It is also great for anyone looking for vegetarian recipes. This eggplant parmesan recipe is just one of our amazing collection of Italian recipes. You can browse them all here.